Have you ever been a little over ambitious about a craft project? 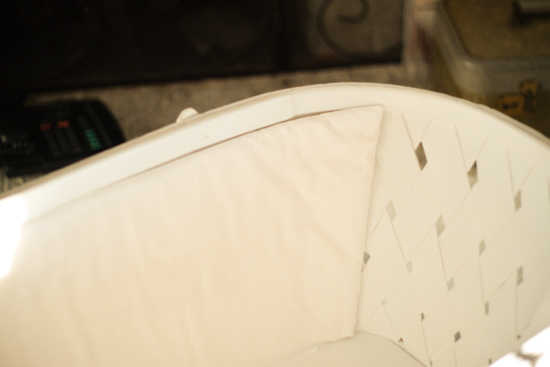 This bassinet bedding ended up being one of those projects I thought I could crank-out in an afternoon or two (not sure where that idea came from considering the fact that I am definitely still a beginner sewer). I came to find I may have over estimated myself. 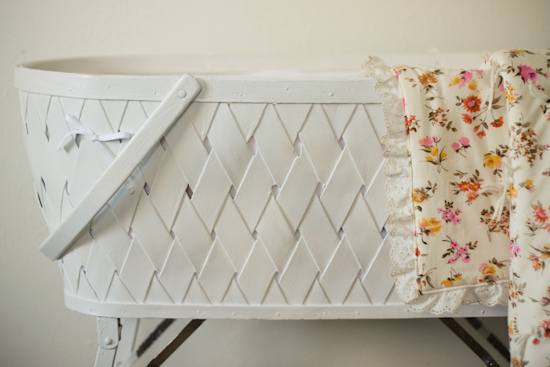 This vintage bassinet was a great thrifted treasure (it only cost me $3!) 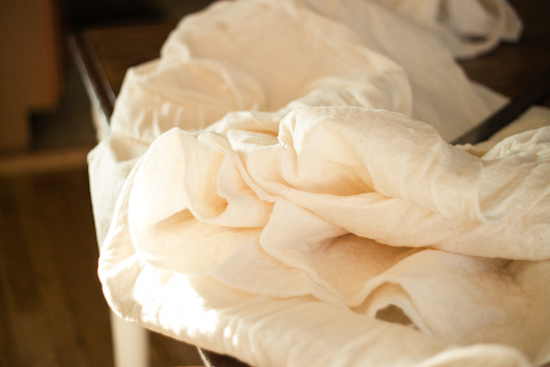 but due to it's odd and outdated dimensions I had to make all of the bedding myself. I started with the fitted bumper, which ended up being the hardest part (I think it took me a whole week of 'nap-times' to complete!). 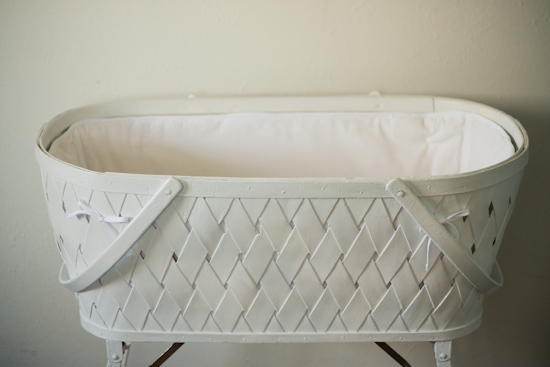 I found some great DIY crib bumper tutorials online and thought I could just use those and shorten the measurements to what I needed. 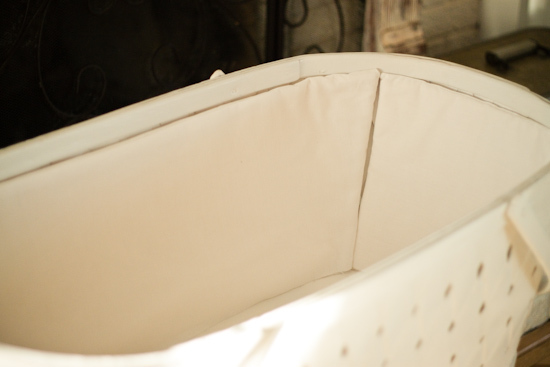 Turns out, the shape of my lovely bassinet is actually larger on top and smaller on the bottom so I had measure and sew all of my pieces at an angle. 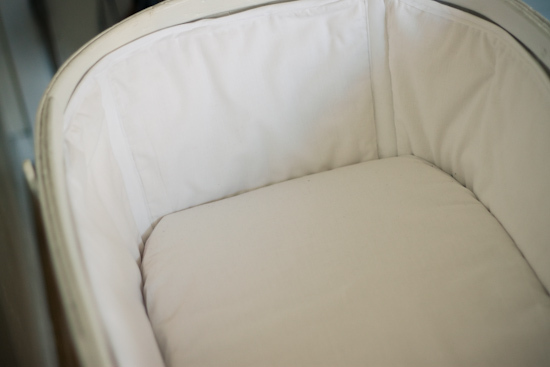 I know it doesn't look like I did much, but I actually ended up sewing a baby bumper, 2 fitted sheets, 1 cozy mattress topper, and a baby blanket (as well as giving the bassinet a fresh coat of paint). But I am SO happy with the way everything turned out and glad that I chose to stick with it and finish the project! Get a few more photos and details by clicking below! To make the custom bassinet bumper I first measured all 4 sides of my bassinet. I then used the dimensions to cut my batting. (each piece has 2 layers of batting). 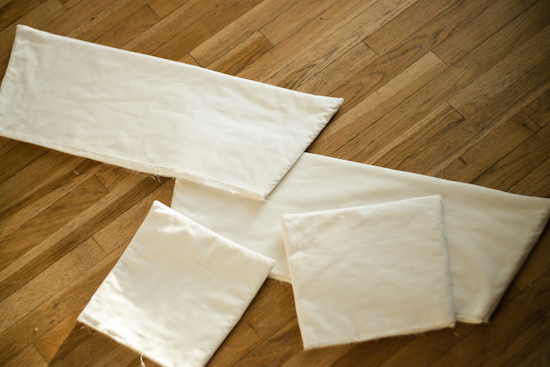 Then, I basically made pillow cases for my batting by cutting my white fabric to the same dimensions (but adding about 1" all the way around for a seam allowance). 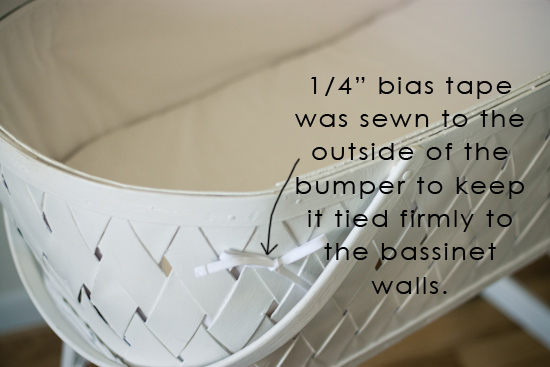 I attached the bumper together by sewing pieces of 1"wide bias tape to each opening. I also sewed the bias tape to the top and bottom of the bumper to give it a more finished look. I then sewed 1/4" pieces of bias tape to the outside of the bumper. This helped to keep the bumper from slouching. So cozy! ♥ Your baby will be so happy to rest there! I know, I would! Everything looks great! I love that vintage-y fabric you chose for the blanket. It looks beautiful! What a great job you did! Wow you really did a fabulous job. I would consider myself an intermediate possibly an advanced seamstress in some areas and I consider this a little bit of a challenge. So awesome. =) Glad you stuck with it. 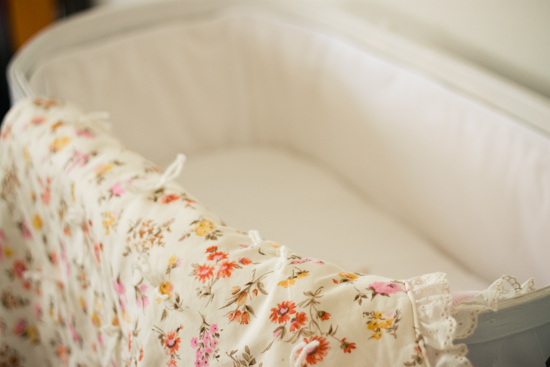 Wow this bedding looks beautiful! I'm sorry it took so much more time and work than you originally planned, but it does look really good! So cute Andrea! I'm so glad you posted about this! 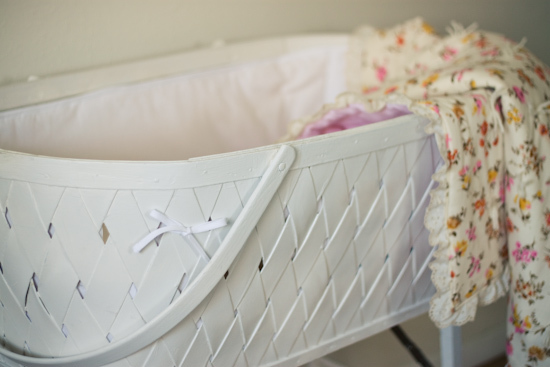 I bought Harper a vintage doll stroller that needs a bumper and little mattress pad, it's the same shape and angles down as well. Yours helps me to see how I should go about making one for her doll's stroller. You are a life saver! Holy cow! I would have no idea where to start! I love the baby blanket fabric; totally reminds me of you! I am amazed Andrea. What a beautiful job you did. I never even gave you sewing lessons. You are one talented girl! I forgot to add, one very smart girl too, to figure that all out. It looks comfy and classy~ perfect. You're so lucky to find something like this, that's why we do understand your effort for this project. this is absolutely darling! 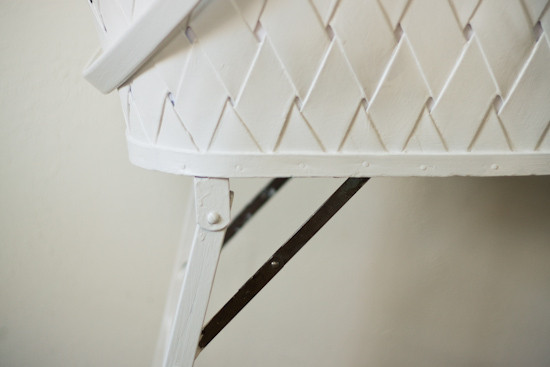 I found you via a google search because I'm looking to make a bumper for my own vintage bassinet. Now I'm going to go look around to see if you posted a DIY for that baby blanket because I love that, too.